The Green Girl cheered on her fellow Sole Runners and friends at Mile 18 of the LA Marathon this weekend. Coach Gary and I headed up to Century City early Sunday morning to meet up with the rest of the Sole Runners support crew. 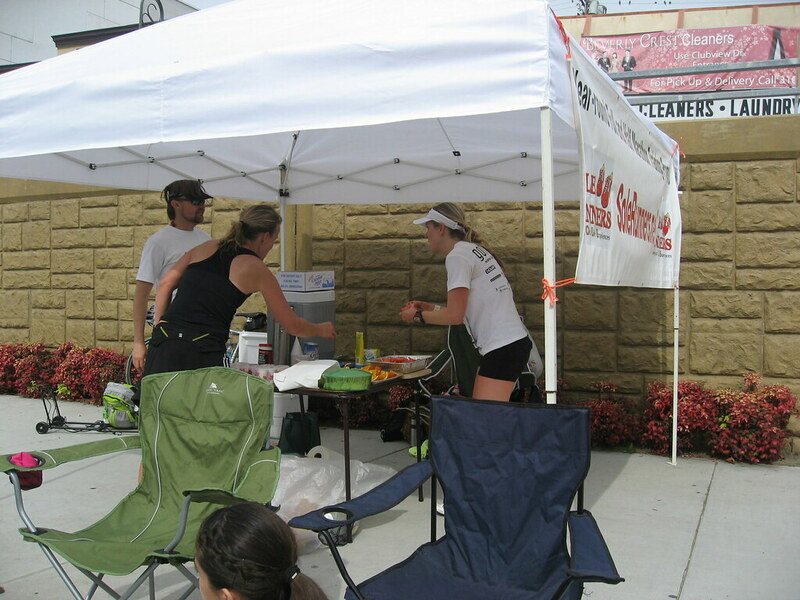 We set up our tent and table just past the giant inflatable Mile 18 marker directly across the street from the Century City Mall. Coach Gary mixed up a concoction of coconut juice and Trader Joe's Super Red Drink Powder. We had the usual bananas, oranges, and watermelon but we also had salted potatoes. I had never heard of salted potatoes but Coach Gary suggested I cook up a batch of potatoes and drown them in salt for the runners. I was really nervous as I prepared the potatoes because I'm not exactly a seasoned chef so I was really relieved to hear compliments from the runners on the salted potatoes. 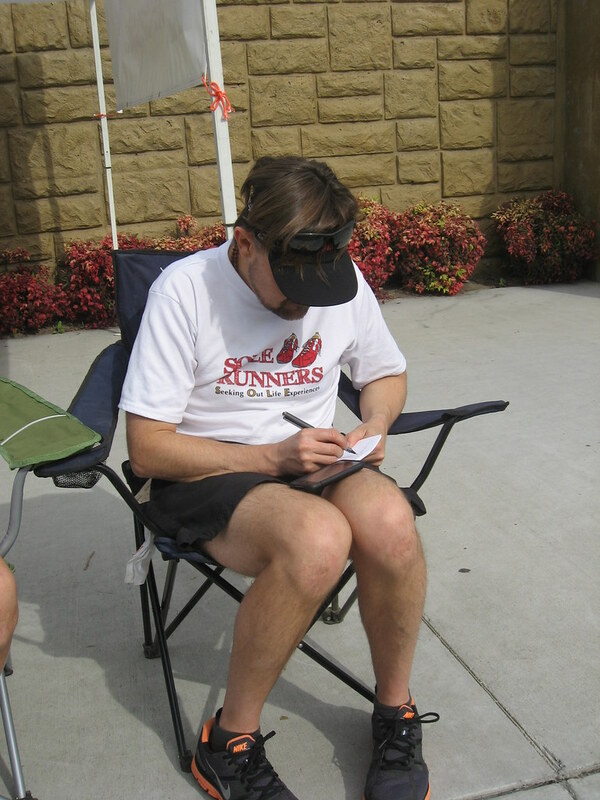 Coach Gary took the time to write out inspiration notes by hand to give to the runners as they came through. Before each one of our training runs, Coach Gary would share an motivational story with the group so I knew this was his way of giving that emotional support to the runners since we weren't with them at the beginning of the race. 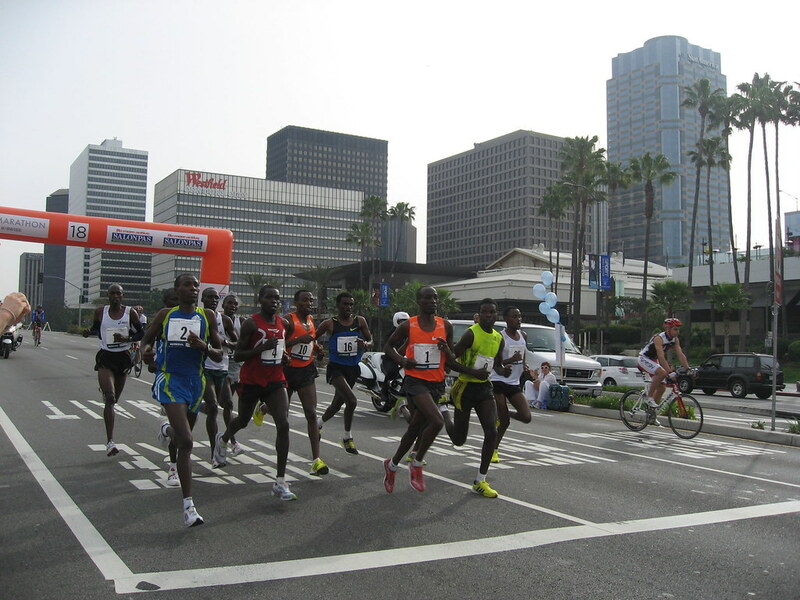 Before we knew it, the elite runners were already running by. I was surprised to see such a large group. Once the elite went by, I knew it would be awhile before I saw anyone I knew. The first runner I recognized was Billy who was running with his friend Chic Runner. Angie actually saw me before I spotted her and we quickly hugged. 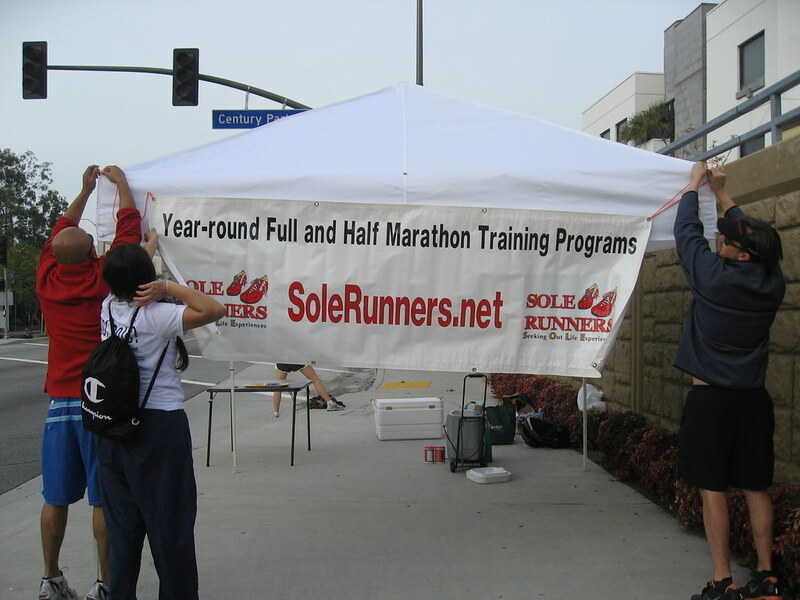 I enjoyed seeing the happy expressions on the Sole Runner's faces when they spotted our tent. When I saw the 5:30 pace group go by, I knew my friend, Cherri, would be coming by soon. 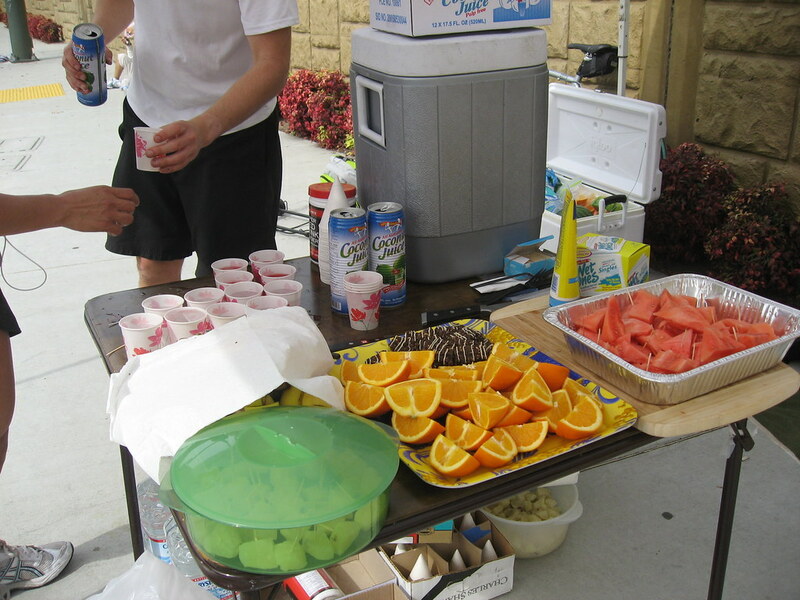 I put some some watermelon chunks and an orange slice in cups and waited. The minute I spotted her, I ran out to run with her. I was very impressed by how strong she was this far into the race. I ran with her for a bit and then I wished her the best of luck and turned around. From that point on, I would look for Sole Runners going by and I'd run with them for a little while and then turn around and look for the next Sole Runner. When I was running with Colby, we happened to go under a photography point so thanks to her, I have an offical LA Marathon shot of myself. I know I might be a biased Green Girl but I think the Sole Runners running group is the greatest in the world. Once Coach Steve got to Mile 18, he waited until every single Sole Runner had gone by before he headed out to complete the marathon. I love the encouragement and support I get from my coaches and my fellow Sole Runners. It means a lot to me that there are always Sole Runners willing to wait for me at forks in the trail so I don't get lost because I'm so slow and so far behind the rest of the group. I was really impressed with all my fellow Sole Runners and friends but I was especially proud of all the first time marathoners. You did it! Wow! Insperational quotes?! That is way to cooL! I have never heard of such a thing, but i am sure it was like the cherry on top, I can only imagine! AND a official LAM pic of yoU!? Too cool Mary, way to cool! Thank goodness for givers like you! Yeah, Coach Gary is awesome like that. Before each run, he'd share some motivational story with us. I know! 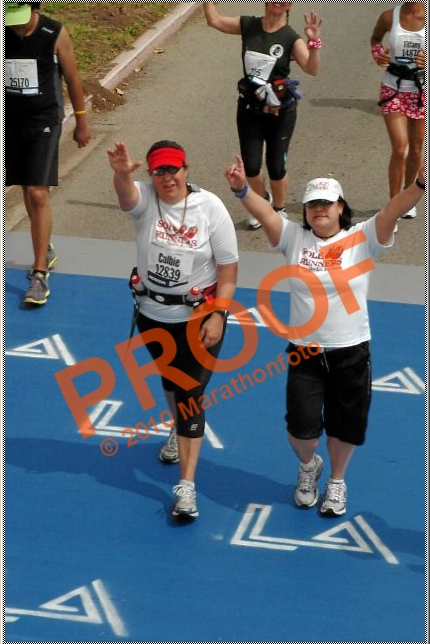 I am so excited that I have an offical LA Marathon picture of myself! Kudos on the salted potatoes. They are a lifesaver on trail runs and ultras when the only thing I crave is something salty. That was seriously so awesome of you, to be there! Glenn, I was disappointed that I missed you. 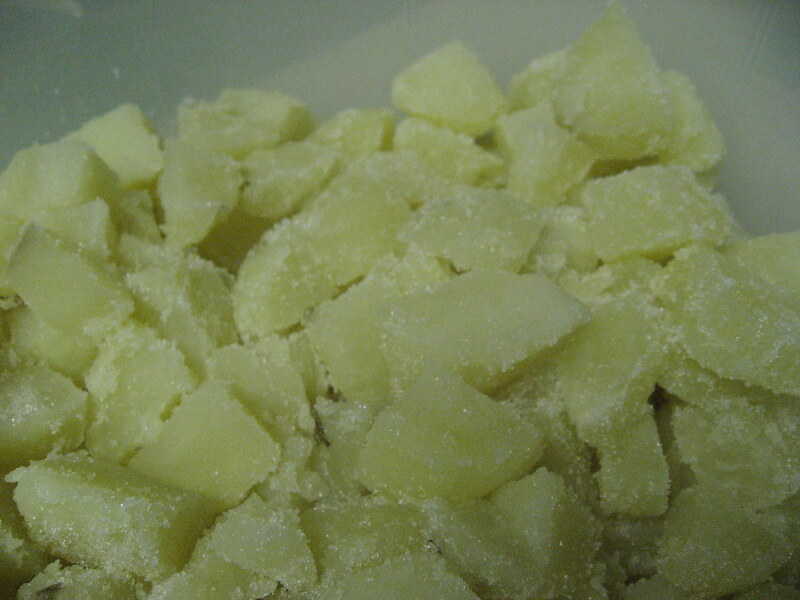 I was surprised how tasty the salted potatoes were. Before I put them in the fridge the night before, they looked like they were covered in salt but by morning, I guess the salt had all soaked in so they looked normal again. Angie, thanks girl, I had so much fun! SoleRunners sounds like a great group! I'm hoping to check out one of their Sat runs in Long Beach, but I work a lot of Sats. I'm a total newbie, and gradually working my way up to the Seal Beach 10k, hopefully the LB Half, and eventually the 2011 LAMarathon. I watched my wife at the LAM, and determined now to at least start with her at the 2011 LAM. We'll see.. Any insight on the SoleRunners? Obviously, you like them.. but for someone like me who is an out-of-shape newbie that may not be able to make half the Sat long runs? The salt potatoes look tasty. Care to share the recipe? Ok.. thanks. Hey, Doc! Thanks for stopping by my blog. I may be biased but I think the Sole Runners group is perfect for people just starting out. We run for time - not distance - so there's no pressure to go faster than you feel comfortable going because everyone will turn around at the same time. I also cannot say enough good things about ChiRunning. Before ChiRunning, if I did a long run, I would have to spend the rest of the day in bed icing and resting. Now that I apply some of the ChiRunning techniques, I recover much faster and I don't have to spend the rest of my Saturdays in bed. I really hope you'll be able to join us and I look forward to meeting you!